The temperature pattern tells two different stories during the meteorological winter (Dec.—Feb) in Nebraska. Three-month average temps in NW Nebraska were nearly 5°F below normal and temps were 5°F above normal in the eastern 1/2 of the state. After a warm fall, temperatures plummeted in mid-December and early January. Temperatures dropped to more 30°F below zero in some locations, which were some of the coldest temperatures we have had in a few years. February told a different story with extreme minimums dropping to -10°F in the NW and 12°F in the SE. Max temps in February reached near 80°F in southern Nebraska to the upper 60s and low 70s in the northwest and northeast. February ended up being the 9th warmest February on record for Nebraska and the three-month, winter-time average was the 27th warmest on record. Current 4” soil temperatures are in the mid 30s in the west to mid 40s in the east. Some locations in central and southeast NE have had soil temps range from the upper 50s/ low 60s to near freezing, just in the past seven days. The precipitation pattern this winter also mimicked the temperature pattern. Whether we like it or not, snow is needed in Nebraska, but too much (or too little) can create challenges. Northwest NE saw plenty of snow since December 1st (50-60”) and ended up 20-30” above normal. This is beneficial to winter wheat, especially since temperatures were bitterly cold at times this winter. The southern 1/3 of Nebraska was 10-15” below normal with much of the area receiving less than 10-15” of snow. For overall precipitation, most of the state ended up within an inch above or below normal for the winter, due to the multiple rain events in December and January that offset a lack of snowfall for many areas. For soil moisture, the southwest portion of the state is much below normal and in moderate drought conditions. Most of the state has adequate rootzone moisture, but surface moisture is lacking in a number of locations due to warm temperatures and high winds. This has caused blowing dust and wildfires across Nebraska and the central plains. 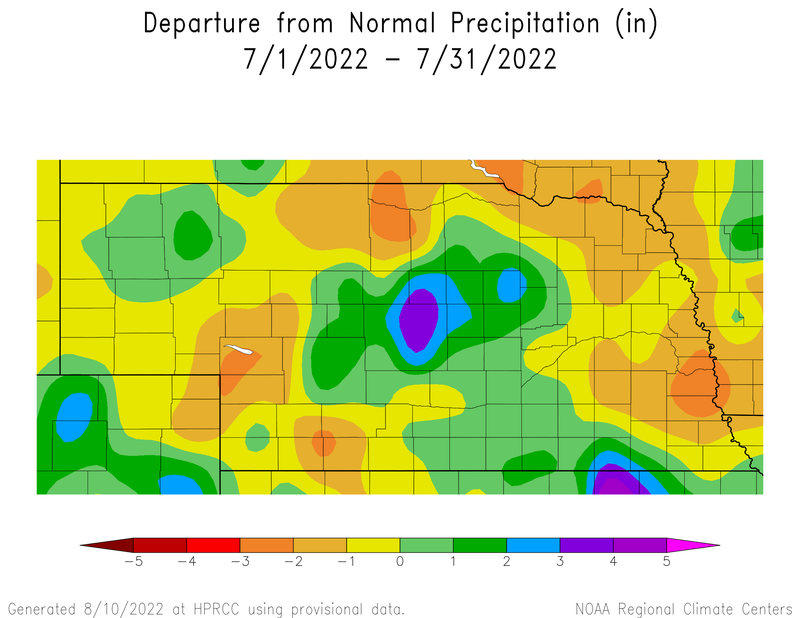 The dryness in southern NE needs to be monitored closely. Spring is here (at least the meteorological spring); however, the forecast is going to look like winter for the next few days. A trough will set up over the northeast U.S., and northwest flow will dominate our region bringing in cooler air. A number of disturbances will track across the northern plains, with most of the snow from this to be outside of Nebraska, however, eastern Nebraska will likely get some of the snow. Nonetheless, cooler temperatures will dominate with a strong temperature gradient from NE to SW Nebraska. Temps will struggle to get above freezing in the northeast, while the southwest could see 40s and 50s (maybe 60s). Lows could dip down into the single digits in far northeast Nebraska and may cause some issues on early spring growth. Official snow forecasts haven't been released for the entire event, but there are potentially three precipitation events that look to track across northeast Nebraska through Tuesday. Temperatures begin to warm back up the middle of next week, however, snow covered areas will recover more slowly. The 6-10 and 8-14 day forecasts are showing a strong warm up for the central plains as the jet stream appears to push further to the north next week. This northern push will also take most of the precipitation chances with it. If the models are right, we could see very warm temperatures next weekend before a number of disturbances make their way back into the area. The models are all over the place to end the month, so we could see a fairly turbulent last couple weeks of the month. The long-term outlook for the spring and even into the summer is where it becomes more important, but even more challenging. The last couple years have seen early warm-ups followed by an abnormally wet April. The most recent 30 year trend has shown a significant increase in April precipitation for most of Nebraska. Mother Nature doesn’t follow an exact calendar, but we typically follow up these warm, dry spells with a bout of cool, wet weather. The question is if our cool, wet weather will come at the end of March and start of April or will it come at the end of April similar to 2016? The La Niña is dwindling, but the cold water in the N. Pacific is causing our weather to behave similar to La Niña conditions. This opens up the question of dryness later in the season. It appears we may pick up some decent moisture over the next 2-4 weeks and we may need that going forward. Click for the Nebraska Ag Climate Update survey. Your participation is appreciated. I study weather and climate impacts on agriculture, climate variability, and using weather and climate information to make better agricultural decisions.